1. Add station selection on waterfall. 1. Add auto squelch function. 2. Add smart auto tracking function. 4. Increased decoder sensitivity and accuracy. 5. Add speed limitation function for low and high speed. Look: Menu / Configuration / CW tab. 6. Real time speed detection. 1. Increased decoder sensitivity and accuracy. 2. Increased program speed due to code optimizations. modes, windows waterfall / spectrum splitter position, contrast and levels. Program uses optimized narrow 80 Hz DSP filter for 5 – 60 WPM speed. 1. Fixed bug with colors and components positions on different Windows versions. Also changing Windows themes now all should be set OK.
2. Fixed flicking on text. 4. Added “Always on top” function. 6. Added text selection and copy function. 7. Added possibility to send selected text to external Logger via UDP protocol. 8. Added logger source code example and program for logger developers. 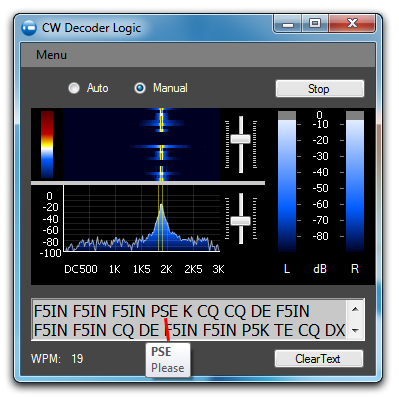 Cw Decoder Logic v1.0.0.1 release 2016.10.17 for Windows: Vista sp2, 7, 8, 10. Program uses Microsoft .NET Framework 4.5 or higher. Please install it if requested by setup. Auto tracking CW signal in 3 KHz range or manually select the station. Auto speed detection in few msecs. “Tips” feature. If mouse moved on unknown word, tip popups with annotation about this word. Also familiar words are separated. For advanced user: In install directory there is a “tips.ini” file. 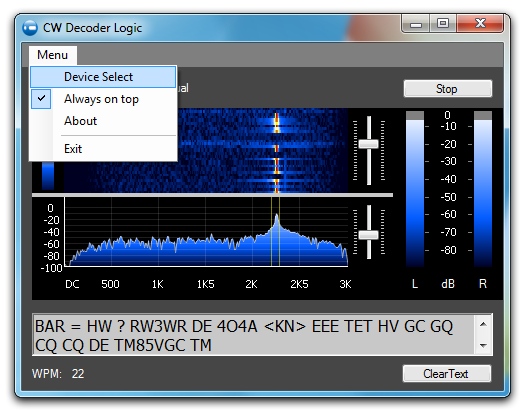 I have tried several CW decoders and think this is one of the best. 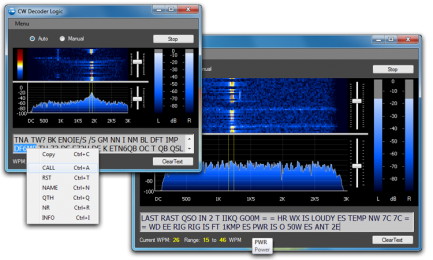 I have both tried it with a WEB SDR which I found on the internet, and also with my Icom IC7300 tranceiver. Top chap for both his software and customer support. nothing is too much trouble for this guy. keep up the good work its very much appreciatted. Thank you so much for your software. I had a few old (really old) CW programs on HDD, most of them wouldn’t work with later operating systems, but yours installed immediately and ran right away with the auto option picking up and decoding like a champ. I do not need a CW decoder as I know CW. I like your spectrum display as it is useful to zero beat stations with filters open wide. It serves as a 3 Khz pan adapter. Could you write a version that is just the spectrum display with a slider to mark the side tone frequency? My radio is set for a 900 Hz side tone. It would be nice to have a marker that indicates where in the 3 Khz the marker is. Remove all but the spectrum display to save on processing and screen real-estate? I have a head on your idea. If I have time I will try to do. Thanks for the nice free cw decoder logic. I have it alway’s running when i operate cw. I think more ham’s get in the cw to do cw. 1. Kuomet esi Manual select mode, norėtųsi spragtelti ant signalo rodomo krioklyje, dabar (v1.0.0.3) turi nuvesti pele į spektrogramą. 2. Auto sistemoje pamasčiau apie savotišką “squelth”. Veikimą įsivaizduoju taip: rankiniu būdu nusistačius „squelch“ lygi (pvz.-45dB), dekoduoto CW signalo tekstas esantis aukščiau už nustatytą lygį butų – juodas, žemiau – pilkas. Taip butu lengviau skaitomas iškoduotas tekstas, kuomet yra du CW signalai arti vienas kito. 3. Būčiau dėkingas jei atsirastų Portable (USB) programos versija. Sveiki, Edgarai, 1.0.0.5 versijoje yra stoties žymėjimas ant vandens krioklio. Taip pat auto squelth’as. Išskirti stotis spalvomis būtų labai painus reikalas, stočių signalų lygiai labai greitai kinta ir tekstiniame redaktoriuje gan sudėtinga spalvoti skirtingomis spalvomis. Dėl “Portable” versijų, prašau rašyti į zilvinas@epalete.lt, atsiųsiu. Noriu kuo mažiau dėti .zip failu su .exe turiniais į tinklapį. Jau turėjau reikalų su antivirusinėmis programomis, kai pradeda blokuoti kaip įtartinus objektus ir pilnai užblokuoja tinklapį. Would like to thank you for CW Decoder. Works fine with my setup. Thanks for feedback. I glad. Now i preparing a new version that will be more sensitive and faster detection a new speed stations and other features. It remained prepare auto Squelch. 73! Sveiki, Justinai, gaila, bet Microsoft’as matomai jau nepakeis politikos ir negrįš prie XP palaikymo. Manau jų tikslas uždirbti iš naujų programų. O atsinaujinti programą būtų gal ir paranku, taip kompiuteris atsigaus, o senos programos ant naujesnės Windausų versijos turėtų visos veikti. Thanks for the nice decoder. Version 1.0.0.1 works fb on my laptop (Lenovo Thinkpad T500 – W7/64) but version 1.0.0.2 does not even start on the same laptop. No error message or whatever. What could be wrong? strange. 1.0.0.1 and 1.0.0.2 version same input (record sound) code, not difference. And question, if you click on “Start” button his changed to “Stop”? Ar turit galvoje, kad viską slėpti menių? Man norėjosi, kad pagrindinių nustatymų nereiktų ieškoti tik pasileidus programą. Bet kaip nuspręs tauta, taip ir padarysiu. Zilvinai, dar reiktu INI failo, kad issaugotum formos dydi ir pozicija ant ekrano. Sveiki, Vygi, ateityje turėsiu omeny. Kolkas tik keli nustatymai, tai labai nesirūpinau šituo klausimu. Bet matomai teks, jei programa tiks vartotojams. Thanks for the decoder, it works like a charm! I am glad that everything works. At the moment I try to increase the sensitivity and quality of decoding. Optimized speed and some nuances that will turn in the next version. I am also having issues. The program runs on my ACER W3 tablet. It has windows 10 and is 32 bit computer. My other two computers are 64 bit and neither can find the internal sound card and I have a “starting device error”. Running the program on the tablet looked great. However my main computer for all my CAT and digital is a Gateway quad core, 64 bit Windows computer.. Sure would love to see it running on it… An suggestions or should I just keep looking for updates? Hello, Harry, tnx for info, but please specify or see the sound card and only startup throws error message? Program is for 32 and 64 bit. This error, only in the case if it can not record 44100, 16-bit stereo, and if the device being used by another program. I ask for more information about the existing applications running, because most likely that the sound card used by another app. I hope will be able to figure out the problem. If not, please let me know zilvinas@epalete.lt or hear. Please send print screen which audio cards sees decoder. Please look or Antivirus not blocking any function. Also if another program use sam record devise, decoder can’t start. In few day i release new version 1.1.0.0 with bug’s corection and new function addet. Sveiki, šauni programa. Pasigedau dekoduoto teksto copy funkcijos. Būtų šaunu, jei programa veiktų Windows XP aplinkoje. Ačiū, 73! Parašiau, kad kopijuoja tekstą, bet galutinėje versijoje pasirodo išjungęs buvau kopijavimą į klipbordą. Aš jau ruošiu kopijavimo su pelyte ir su greitais klavišais Ctrl+C, dar liko keletas niuansų. Jau buvau padaręs bet nusprendžiau patobulinti. Kol vyksta kopijavimas, kad dekoduotas tekstas galėtu rašytis toliau, nes buvau pristabdęs rašymą kol vartotojas kopijuoja. Dar prisėsiu prie lango didinimų – mažinimų ir pasidomėsiu protokolais palaikančiais populiariausius logerius, tada paleisiu naują versiją. Dėl XP, gaila, bet Microsoftas atsisakė palaikyti pagal juos pasenusią sistemą ir jau neleidžia parsisiųsti .NET papildinių. Nors kažkur skaičiau, kad yra galimybė apgauti sistemą ir suinstaliuoti .NET4.5, bet atsiranda kiti bugai sistemoje. Tai vieną dieną gal sugalvosite pasikeisti į naujasnę sistemą ir bėdos dings. dėl interfeiso logeriui aš pagalvosiu. Gal tiesiog pažymėjus tekstą ir nuspaudus dešinę pelę atsirastų langelis su Call QTH RST t.t. ir pasirinkus vieną iš jų tekstas keliautų tiesiai į išorinį logerį? Dėl fiksuoto dydžio, jį bet kokiu atveju teks limituoti ties kažkuriomis vietomis, bet galima bus pagalvoti. Labiausiai nesinori leisti išdidinti programą per visą Windausų langą, nes mačiau pavyzdžių kaip negražiai atrodo platūs kvadratai ant vandens krioklio “waterflow”, bet čia mano subjektyvi nuomonė. I’m glad that you like. Also I wait for comments. This is a BRILLIANT programme! One of the best such decoders that I have ever seen! Thank you!